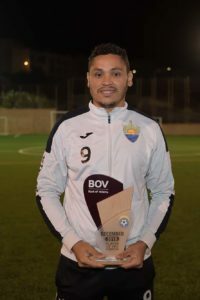 Nadur Youngsters forward Marcelo Barbosa is the BOV GFA Player of the Month for December 2018. 27-year-old Barbosa, who joined Nadur Youngsters from Għarb Rangers during the summer transfer window, was arguably the best player on the field in Nadur’s 4-0 defeat to Birkirkara in the third round of the FA Trophy and also in their 4-3 win over Victoria Hotspurs in the quarter-final of the First Division Knock-Out competition. He scored the all-important goal in their 3-2 win over Għajnsielem in the BOV GFA league and also opened the score in the 3-1 win over Sannat Lions in the BOV GFA Cup quarter-final. 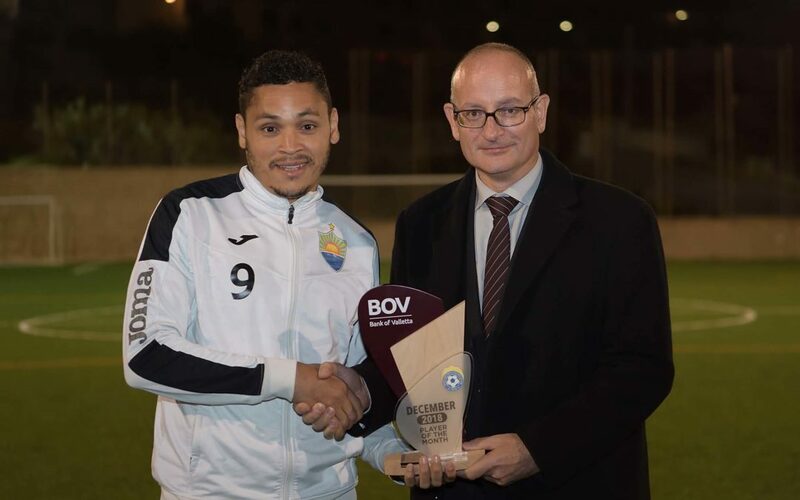 Horace Laudi, Executive Gozo Region for Bank of Valletta presented the trophy for the BOV GFA Player of the Month for December 2018 to Barbosa who in turn chose The Arka Foundation to benefit from the donation associated with this award.